People usually say, “There are lots of opportunies for university students to join various club activities and widen their views!” While it is true that there are plenty of clubs promoted on SNS and online communities, today, the number of more unique and various clubs are increasing. Have you ever thought about playing Quidditch? Yes, that very same game that appears in the ‘Harry Potter’ series. It may not seem likely to be played in real life, but you can play it with friends. After the game, you can even enjoy a good meal at a restaurant. A year ago, these various unique clubs became topics of debate on the show ‘Yang Se-chan’s Ten’. The hosts were quite surprised to learn of the unique new clubs such as chicken club and hot-air ballooning. The images of the clubs were far from the typical student clubs that most people know. Today, more and more diverse clubs are being introduced on TV shows, social networking services, and portal sites. ‘Yeonnamdong (Salomon: Eating up salmon)’, an intercollegiate club in Shinchon, operates under the motto “Just like Woongnyeo (a bear from a Korean legend) ate mugwort and garlic until she became human, we, too, will eat salmon until we become bears.” Club members of Yeonnamdong started to gather because of their love for salmon. They enjoy going to tasty salmon restaurants and chatting with others who also enjoy salmon. 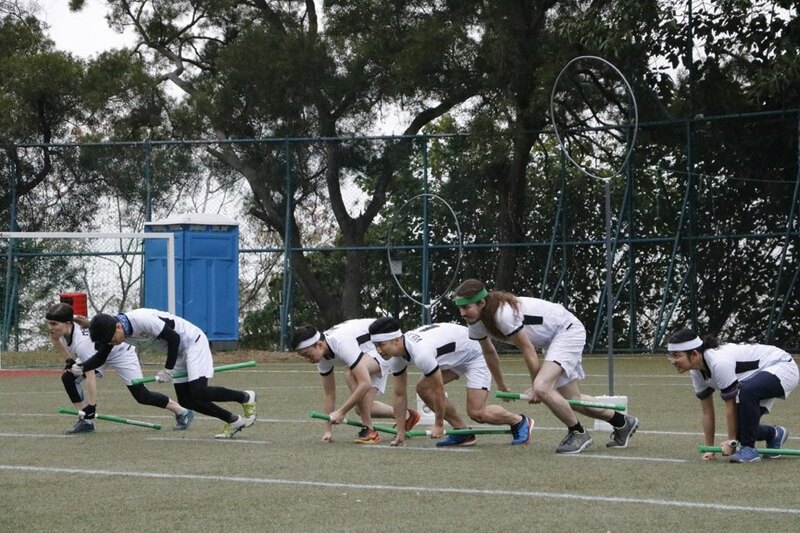 Even, at Seoul National University, there is a Quidditch club called “Puffskeins”. Quidditch, a fantasy wizard sport in the Harry Potter series, has become a reality and is growing in popularity. Players do not fly on broomsticks, but instead hold a stick between their legs throughout the game. Players also follow all the rules outlined in the books of Harry Potter. “Seoul Puffskeins” is the first Quidditch club in Korea, but another team has also recently been established. The name of the club is “The Muggles” and it was found at Cheongju National University of Education. Since 2012, the club has organized its own version of a world cup each year. Besides these clubs, there are others like the Hanbok and garden club, and they are on the rise throughout university campuses. Like this, students can find many unique and special clubs according to their own interests. There are several reasons why these unique clubs are on the rise. The society has changed, and people are starting to pay more attention to diversity than popularity. In the past, clubs mainly focused on popular concepts or behavior such as ideologies, sports, and arts. However, nowadays, people are more concerned with diversity; as a result, it has become trendy for clubs to more focused on particular topic.1) For instance, there is a specialized club geared solely to the eating of chicken: the chicken club rather than creating non-specific ‘food’ clubs. In addition, clubs are gaining more publicity due to changing viewpoints. Since students are recognizing the importance of animal rights, intercollegiate clubs that deal with abandoned have sprung up. The advance of Networking System has also contributed to the rise in number of unique clubs. Most clubs have their own SNS accounts, and they post their mottos or activities on their Facebook or Instagram accounts. Club members, as well as others, have constant access to their clubs’ activities. For example, Yeonnamdong has 1,458 followers, and “Quidditch Korea” has 1,282 followers on Facebook. Since the posts from the accounts are shared by many followers, information on unique clubs is widespread on SNS, which makes it easy to interact with other clubs or associations. The fact that university students are now prioritizing their tastes over career preparations has brought about the rise in unique clubs. This new prioritization is related to the trend of “For Me”, which SMT covered in its last issue. In other words, people are more interested in psychological satisfaction, something that is earned by fulfilling one’s desires. “Phoenix”, the chicken club at Yonsei University, was formed in March 2013. It was started by students at Yonsei University because they want to do something they all loved to do: eat chicken. The club has no restriction on its memberships. They accept students from every school, every major, and all ages. Yu Jaeeun, Prior Leader of Phoenix, said, “I am a first member recruit of this club. The club was started at a time when everyone was busily preparing for their careers. I loved chicken, and I joined Phoenix just for fun.”2) Students are now choosing clubs based on desires, wants, and taste, something that gives them psychological satisfaction. The increased number of clubs are making a better society. Recently, Sookmyung has had students establish a new club. 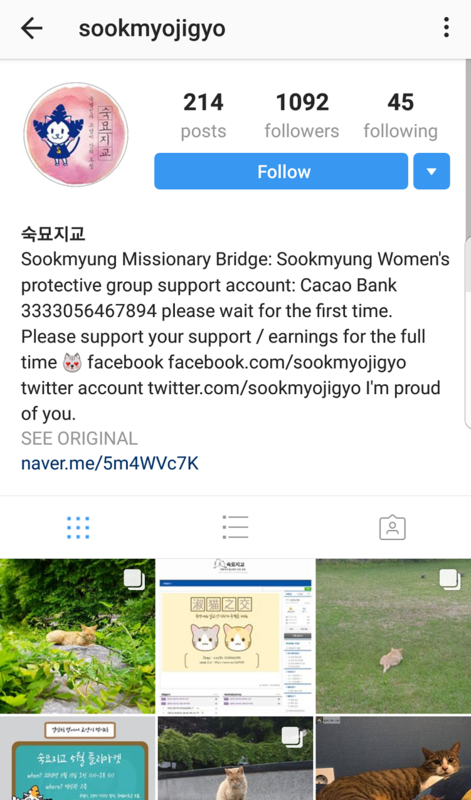 The club name is “Sookmyojikyo”, and it works to guarantee a safe existence for stray cats and their living environment at Sookmyung. Manager of the club said that the club members take great pleasure in helping the cats, which makes members feel better. 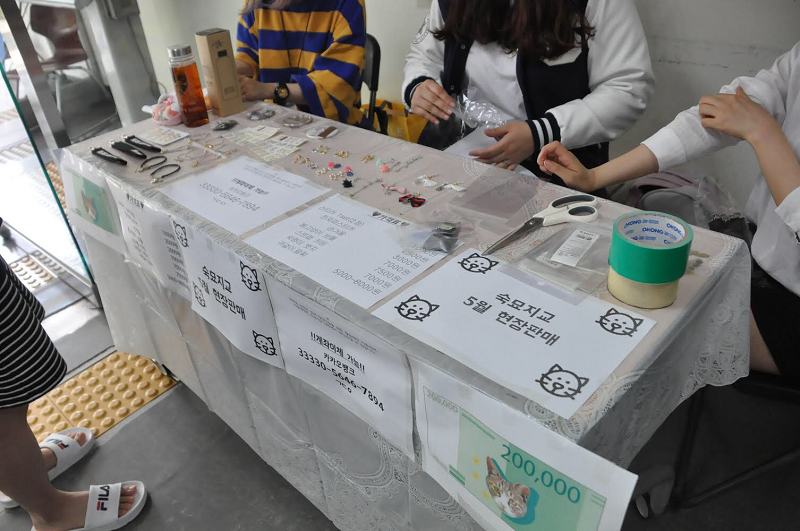 Many Sookmyungians learned of the club and its activities at the recent flea market, where the club did fundraising. People who visited the booth saw the poor living conditions of the stray cats and learned of the severity of the situation. These visitors continued their discussions with fellow Sookmyungians on Instagram. In addition, there is great interest in society in the “Peace Butterfly Network”. Members in this club are publicizing the crimes of the Japanese military by taking on sexual slaves and distorting the reality of history. Even though the club consists of college student members, they work hard to solve the problem by gathering often at press conferences on anniversaries of historical events to give voice to victims. Lim Soojeong, former leader of the club said, "We participate in meaningful activities and members do all the planning, from start to finish. "3) The club hopes to resolve the issue by working with social enterprises and the government. Like these clubs and their activities, students are interested in changing and making a difference in society through club activities. Meaningful outcomes are sure to result when students gather spontaneously and lead change of society. Besides helping society, the clubs also help improve students’ expertise. Dongguk University's Cave Exploration Club goes on outings once a month to explore caves. Club members explore untouched caves, not tourist attraction ones, and report on the exploration after their return. They present their findings to relevant government agencies and cultural heritage offices in order to keep the cave discoveries protected as valuable natural resources. Through the club, students can experience cave exploration, learn to appreciate cave dwelling preservation, vital characteristics of caves, and methods of exploration. Han Yeongjoo, former club president, said that though his major is not in any way related to geology, it was a marvelous opportunity to explore and study caves as an university student because he had always been an adventurer.4) Like him, students can broaden their sights to new possibilities and elevate any school stress by joining these new active clubs. Students cannot only enhance their specialty knowledge but also share hobby interests with others. Best of all, these clubs offer students the chance to do something enthusiastically. Since society is now in the fourth industrial revolution, change might be happening faster. The number of unique themed clubs is on the rise, and perhaps in just a few years, there could be clubs that center around robots or Artificial Intellectual (AI). Take a look around. You may find a club somewhere on campus that sparks your interest and enthusiasm. Can’t find one? Don’t get discouraged. There is no mandatory requirement to join a club. Or you might want to consider starting a club of your own and find that there are a lot of others with your same interest. Tel : 02)710-9152 | Fax : 02)706-2695 | 청소년보호책임자 : 김주희 | Copyright © 2007 숙명타임즈. All rights reserved.